Born February 6, 1901, at Torbrook Mines, Nova Scotia. Ralph, as a child, protected Isabel and Frank by beating up anyone who looked sideways at them. He attended public school until grade 5, when he was compelled to go to work on a farm to help support the family. In 1918, he headed northwest to work at the Macintyre, Crown, and Hollinger Mines in Timmins, Ontario. During his stay in Timmins, he earned enough money to travel to Peterborough, Ontario to study the electrician's trade while working for Canadian Westinghouse. In 1919, during the great flu epidemic, he became deadly sick with the flu. Aunt Annie Cuthbertson (Florence Ann Hansford) went to him in the hospital at Peterborough, took the death screen away, and demanded the best doctor available, who took quarts of fluid off his lungs. He had to have one lung collapsed. He had a very bad scar on his back where this was done. In order for that to heal, he spent hours out on Belmont Lake with his shirt off so that the heat from the sun would penetrate his wound. This is why he always loved Belmont Lake. He felt that being on the lake made him better. In the 1940's, Ralph purchased a family cottage on this same lake, where his children were to enjoy many carefree summers. In 1947, he organized a family reunion for his brothers and sisters and their families at Belmont Lake. In 1925, he went to Windsor, Ontario, and worked for the Ford Motor Company in the day and as a stock boy for Dominion Stores in the evenings. With his spirited nature, aggressive determination, and relentless hard work, he eventually became Senior Vice-president and general manager of Dominion Stores of Canada. During his years with Dominion Stores, the family lived in Windsor, New Liskeard, North Bay, London, and Toronto, Ontario. 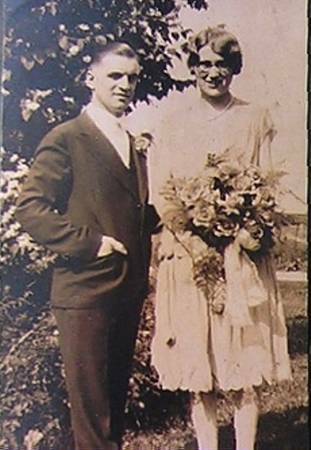 Married June 22, 1929, at Leamington, Ontario. Donald Earl Hansford (b. January 20, 1931, at Windsor, Ontario). Ruth Hansford (b. October 29, 1937, at New Liskeard, Ontario; d. September 17, 1959, at Thornhill, Ontario, of a heart attack). Ronald Richard Hansford (b. March 26, 1937, at London, Ontario).